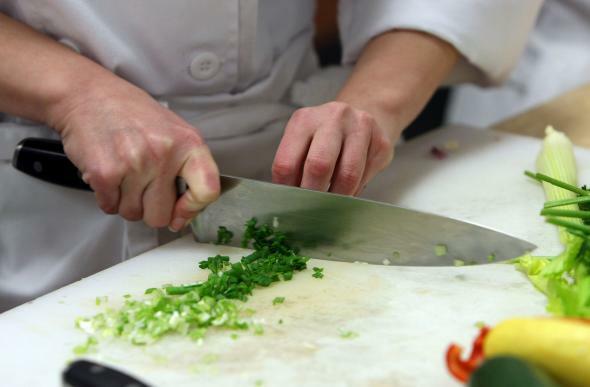 Does being a good cook require excellent knife skills? A culinary student uses a chef knife to cut green onions during a butchery class in 2009 in San Francisco. For most cooks, knife-skill demands are somewhat of a background hum. They’re there, but they’re not the main melody. While uniformity and speed are super important, most of that can be achieved with tools (mandoline slicers, fan peelers, etc.) or handed to the one guy whose life revolves around making brunoise. Where it gets dicey (yes, a poor attempt at a pun) is when guys on veg have both mandolines, and you need a handful of batonnette-sliced zucchini this very instant. Or when you’re racing against the ever-ticking clock of prep and have to flute some mushrooms, butcher 30 chickens, or roll 90 rabbit loins. The good news is that the level of skill you need in a kitchen comes with being in it. Everyone can learn it—easily actually. That little bit extra, the one that drags you out of the weeds just that bit faster or lets you come in a little later, because you can do your mise faster and by hand, that takes time and concentration, but it’s not strictly necessary. You’re asking about good cooks, though. And here I am quite rigid. I think a craftsman’s worth is indeed set by his or her command of the tools he or she has at hand—a carpenter with hammer and chisel, or a dentist with a drill. Ours is, first and foremost, the knife. Maybe you don’t need to be that good, but if you’re a good cook, being that good with your knife is simply one of those things you’ll absorb and do. Waiters and waitresses: If I receive poor service from a waiter/waitress in a restaurant, what’s the best way to show my displeasure? Restaurants: If my bill comes to $15.75 (w. tip) and the waitress claims they have no change am I required to pay in the next highest available denomination? Food: Why are burgers and French fries commonly served together?